Mumbai: Mukesh Ambani, India’s richest man, said on Thursday that Reliance Industries Ltd (RIL) aims to double sales in about seven years, even as the company explores ways to boost profitability of its mainstay refinery and chemicals businesses. Ambani, however, does not plan to rely solely on refinery and petrochemicals, and is placing outsized bets on new consumer businesses to drive growth. RIL has invested about ₹ 2.5 trillion in telecom unit Reliance Jio Infocomm Ltd, through which Ambani wants to venture into e-commerce, healthcare, education and agriculture in the next two years. “As India starts on its high-growth journey to double the size of its economy by 2025, I assure you that the size of Reliance will more than double in the same period," Ambani told shareholders at the company’s 41st annual general meeting (AGM) in Mumbai. “Our consumer businesses will contribute nearly as much to the overall earnings of the company as our energy and petrochemical businesses," he added. 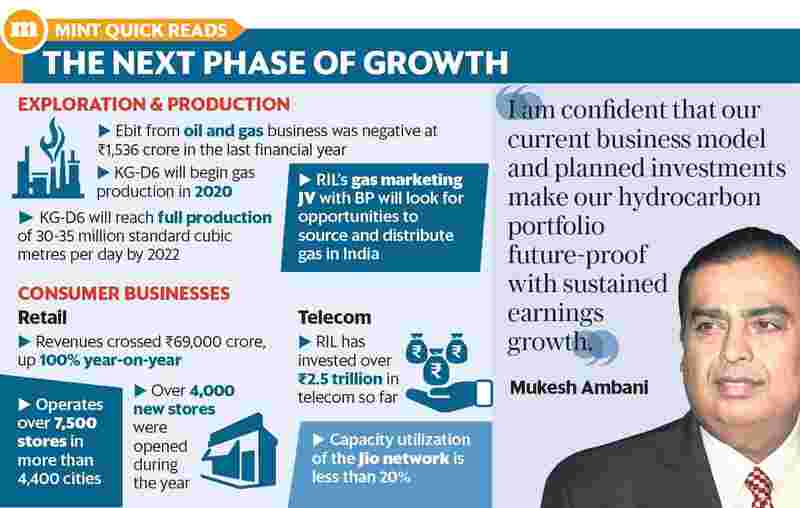 RIL currently derives 80% of its sales from refining and petrochemicals. This however, is undergoing a change as the company focuses on consumer-facing businesses. RIL saw operating profit from its consumer businesses rise to 13% of the total in the year ended 31 March from 2% in the previous year. RIL’s consolidated revenue from operations was at ₹ 4.08 trillion last fiscal and net profit at ₹ 36,080 crore. On the consumer side, Ambani’s immediate bet is on optical fibre-based fixed-line broadband which, he claimed, offers hundreds of megabits per second of data speeds and will allow RIL to offer smart home solutions. “The big story for Reliance Jio from here on is going to be fibre connectivity," said Mayuresh Joshi, a fund manager at Angel Broking Ltd. In the coming months, Jio will extend fibre connectivity to homes, small businesses, traders and small businesses. Leveraging on its advanced fibre bandwidth network, Jio will be offering this service in over 1,100 cities and towns across India. For homes, this could mean ultra HD entertainment, multi-party video conferencing, digital shopping, security cameras, home appliances, voice-activated virtual assistants, lights and switches. Over the past 40 years, RIL has periodically transformed its core business through backward integration. First it was textiles, then it was polyester, followed by chemicals and then refining. In the past few years, a major lateral shift has happened, with the focus on telecom, data, broadband and retail. Now, the energy business is under threat due to a shift from fossil fuels to renewables, and Ambani acknowledges that. “It is our belief that the rapidly increasing demand for petrochemicals maximizing oil-to-chemicals conversion will play a catalytic role in determining profitability of hydrocarbons businesses of the future," Ambani said. “As the world migrates from fossil fuels to renewable energy, we will further maximize this oil-to-chemicals conversion and upgrade all our fuels to high-value petrochemicals," he said, adding this upgradation will happen in a phased manner over the next decade. Still, there are some concerns about the company’s growing debt (about ₹ 1.41 trillion) on account of Jio. “Generating reasonable returns (say a 10% post-tax return on capital employed) off a balance sheet of R-Jio’s size (current levels) needs the company to generate an Ebitda (we compute it to be $8 billion) that is higher than the peak historical annual Ebitda ever generated by the aggregate Indian telecom industry, including the home broadband and enterprise data players, per our math," said Rohit Chordia & Aniket Sethi, analysts at Kotak Institutional Securities, in a 5 July note.